ADD UPDATE, 24 August 2017: Eastleigh’s two newly independent councillors, Steve Sollitt and Sarah Bain, have given their formal support to Action against Destructive Development (ADD) – the group set up to fight Options B and C of the emerging Local Plan. 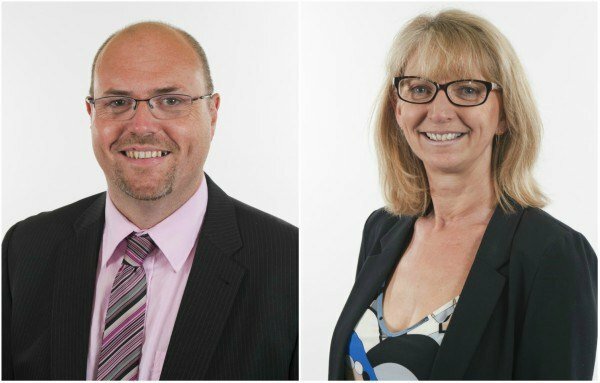 Cllrs Bain and Sollitt resigned from the ruling Liberal Democrat group on Eastleigh Borough Council earlier this month because of their opposition to the proposed Options B and C, which would involve building around 5,300 homes in the Fair Oak and Bishopstoke areas plus a new road running between five pieces of ancient woodland and across the River Itchen. They remain members of the Liberal Democrat party nationally. Their move was backed also by Liberal Democrats in neighbouring Winchester. “I know Sarah and Steve to be passionate about their area. Their brave decision to take a stand on this issue, which affects people well beyond the boundaries of Eastleigh, bodes well for our efforts to get the best possible outcome. We applaud them,” said Richard Izard, a former city mayor and long standing Lib Dem ward councillor for Colden Common and Twyford. Steve Sollitt, a councillor for nearly nineteen years on Eastleigh Borough Council, was brought up in Boyatt Wood and knows Allbrook and the surrounding area well. Sarah Bain has lived in Eastleigh for the last thirty years including eight years in Boyatt Wood. She is a member of Allbrook and North Boyatt Parish Council. The councillors fear the plan would have a detrimental effect on the village and those living there. They believe strongly that the administration on the Borough Council should be doing its utmost to protect ancient woodland and the areas around them and that the proposed road would cause irreversible damage to the protected habitats and biodiversity along the route.